AcqKnowledge is an interactive, intuitive program that lets you instantly view, measure, transform, replay, and analyze data. Perform complex data acquisition, stimulation, triggering and analyses using simple pull-down menus and dialogs—no need to learn a programming language or new protocol. AcqKnowledge software is used by thousands of labs around the world and has been cited in thousands of peer reviewed publications. 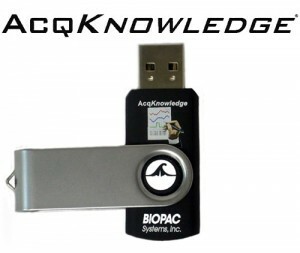 AcqKnowledge is included with each MP160, MP36R, and B-Alert system—it can also be purchased separately. It runs on both the latest Windows and Mac OS X operating systems to provide an industry leading data acquisition and analysis platform. 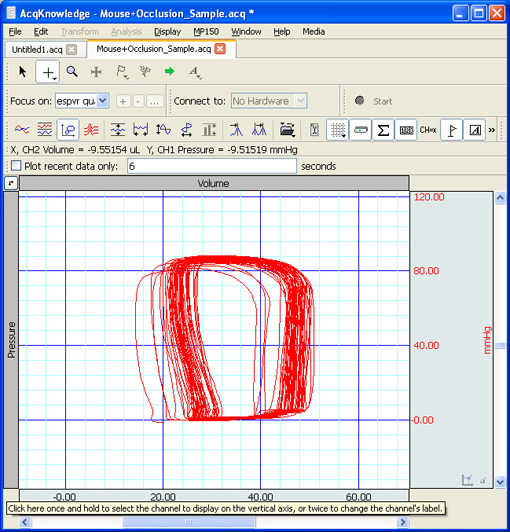 Configure detailed recording protocols with analog, digital, and calculation channels. Easily select and set up your recording channels simply by choosing your amplifiers from the module list. 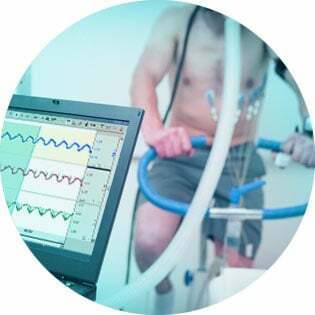 Select from dozens of preconfigured preset calculation channels such as heart rate, respiration rate, flow, volume, dP/dt, and more. Plus, create additional presets and save them for further use. AcqKnowledge has user-selectable acquisition modes (including averaging), sample rates, durations, and automation. Graph windows are also completely customizable allowing multiple views of the same data. 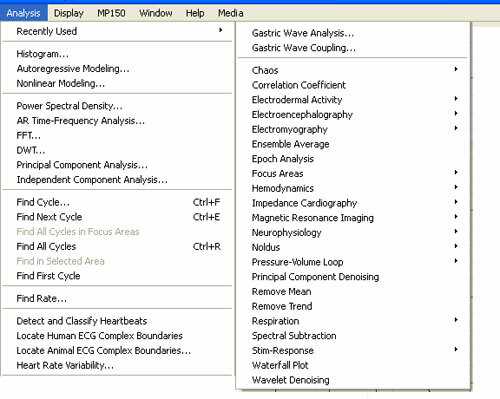 Rearrange toolbars, add custom buttons for analysis routines or transformations, change the color or size of waveforms, grids, backgrounds, text, and more. See data in X/Y Mode, Scope Mode, Chart Mode, or as a Stacked Plot. 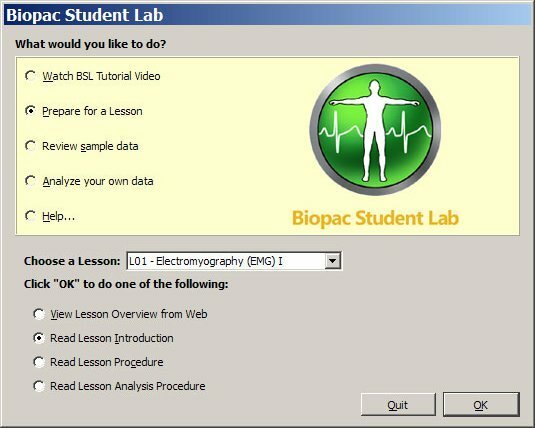 Take advantage of the integrated Media functionality (Windows only) to synchronize your data file to a video recording from a webcam or BIOPAC Camera System. The video and data file will be locked together for playback, allowing the user to simply scroll through either the video or data file and be taken to that same point linked in the corresponding file. With AcqKnowledge, record from multiple hardware devices at the same time. Record from multiple MP150’s, an MP150 and MP36R, MP150 and B-Alert, and more. During recording, select from dozens of available preset channels both for amplifiers and calculation channels. 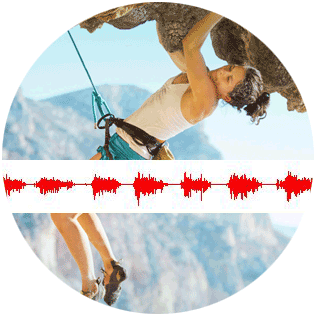 Spend less time on set-up, and get from recording to reporting using AcqKnowledge’s powerful suite of analysis routines. 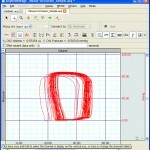 Use the scaling tools to customize the divisions and scaling of both the horizontal and vertical axis. Fully customize the divisions, color, and scaling of the channel grids and save presets for the grid settings used most often (ex: ECG grid). Working with hardware or software from another manufacturer? No problem, AcqKnowledge has import and export features that work with a wide variety of data formats including MatLab, Text, Excel, Noldus Observer XT, and SMI BeGaze. AcqKnowledge can output a range of stimulus paradigms for constant current and constant voltage stimulation. It accepts digital events from virtual reality environments and stimulus presentation systems such as E-Prime, Presentation and SuperLab and categorizes them for further analysis. 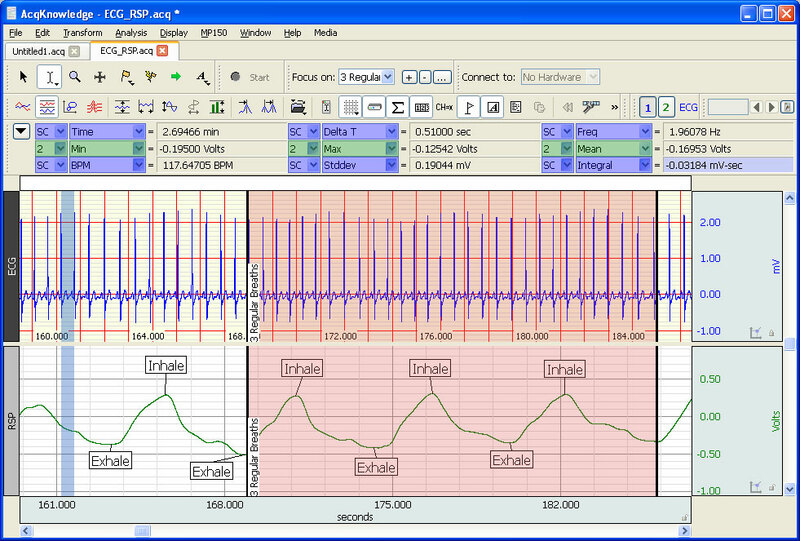 Easily configure single pulses, arbitrary waveforms, and pulse chains for stimulation. Take advantage of fully automated analysis routines created to save you time. 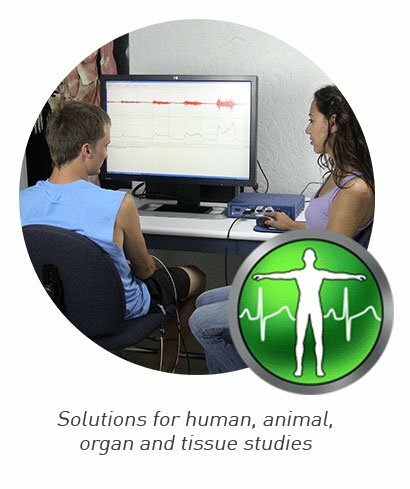 For ECG (EKG) data, utilize the automated HRV analysis or locate and mark ECG complex boundaries for both human and animal signals. 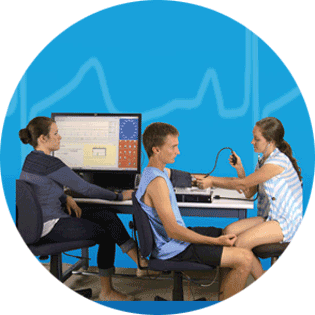 Take advantage of multiple routines available for EEG, EDA (GSR), EMG, and Respiration. Look at RSA or perform a detailed ICG analysis with a few clicks of the mouse. Routines are available for most physiological signals. Create Focus Areas to perform targeted analysis. Select areas of interest within the data file and mark them as focus areas, then simply choose an analysis routine and run it on the Focus Areas only, as opposed to the whole file. AcqKnowledge also includes a wide variety of simple transformations and filters. Filter both during recording or after, find Rates, Cycles, and take multiple measurements over selected data areas. Perform FFTs, and other spectral analyses over selected areas of data or the whole file. Create and evaluate expressions, use the detailed find cycle tool and export results to the journal, as an Excel spreadsheet, 3D plot, and more. Have a question about the software or an analysis routine? 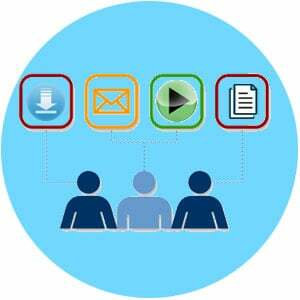 BIOPAC provides a wide variety of support tools at your fingertips! A detailed software guide, dozens of software video tutorials, application notes, and the knowledge base provide instant answers. 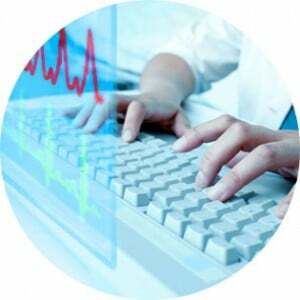 If more information is needed, BIOPAC’s technical support team can provide help by phone or email.